Gorillas are huge! A female weighs around twice as much as an average person. Mountain Gorillas are really gentle giants. They will tolerate people as long as they don't stare. Staring is a gorillas sign of a threat. 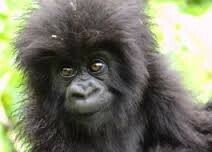 Mountain Gorillas are endangered animals. There's only about three hundred of them left. Because of their huge size gorillas aren't very good at climbing trees. They prefer areas where thick vegetation grows near the ground.